Preliminary enrollment figures show an increase in 122 students in Marshalltown Schools for 2011-2012. 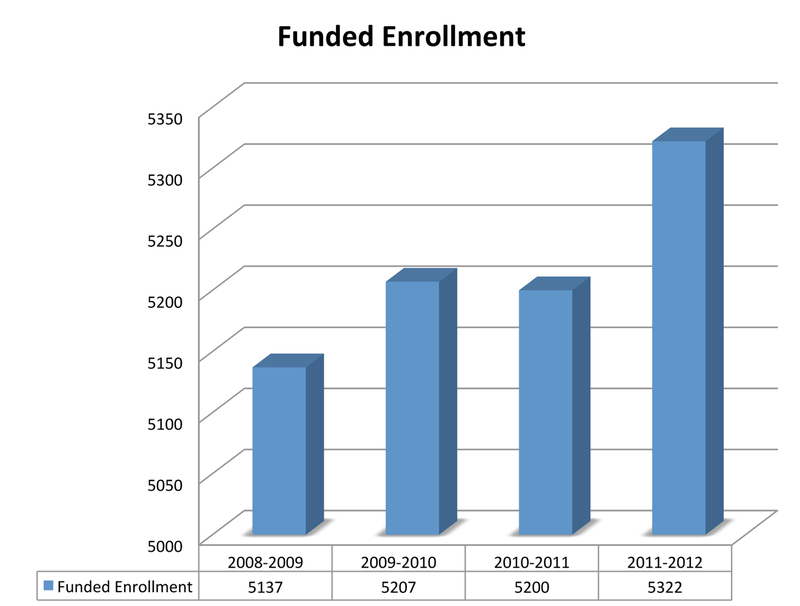 The District has a funded enrollment of 5,322 students, up from 5,200 in 2010-2011. Human Resources Director Lisa Koester told the Board this figure reflects the number of students for which the District will receive funding. Preschool enrollment continues to grow, with 184 students in the program for 4-year-olds this year, up from 162 in 2010-2011. Special Services Director Lisa Glenn said every available spot is full and there are waiting lists at each building. 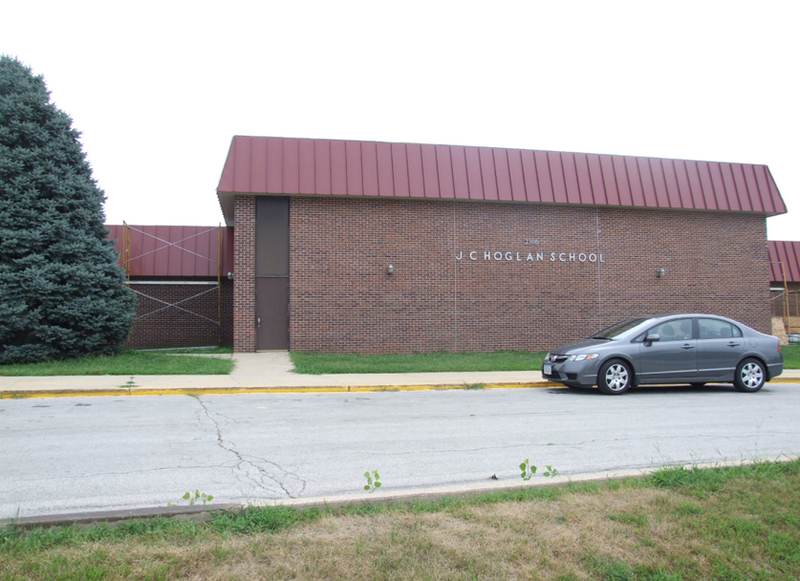 After Fisher Elementary opens a preschool program next fall, all six elementary schools will have preschool. Open enrollment out figures remain around 8 percent, which is consistent with state trends. Rapids Foodservice of Marion was awarded the low bid for upgrades to serving lines at Miller Middle School and Marshalltown High School. The $56,381 purchase includes two hot serving lines and two cold serving lines each at MHS and Miller. The addition will allow students at each school to have their choice of four entrees. The need for increased serving lines stems from the decision to make MHS a closed campus. Food Service Director Vickie McVey said they are serving 400-500 more students each day. She told the Board MHS food service serves 1,000 meals a day in approximately 30 minutes through four serving lines with four entrees, two salad bar lines and two snack bar lines. McVey said the elimination of a la carte sales during study halls and the downsizing of a la carte options (changing four snack bar lines to two meal lines) has meant some decreased revenue. The additional students eating lunch and breakfast, however, has more than made up for that and will help offset the cost of the equipment upgrades. Change orders at the Franklin Field Gateway Project saved $3,044. The major reduction in cost comes from the elimination of 32 stone accent pieces (saving $3,389). Two other change orders were for a combined increase of $345 (welded wire and panels for window openings). The Board approved a Resolution of Acceptance for the Hoglan mansard and soffit replacement project. The project was completed by Vis Roofing, Ltd., of Marshalltown for $134,000. Work on the project began June 20, 2011. Brenda Krough, Hoglan paraeducator, effective Oct. 4, 2011. Cheryl Parker, Miller food service, effective Sept. 16, 2011. Vicki Cruikshank, Franklin paraeducator, effective Sept. 29, 2011. Tracy Macbeth, MHS paraeducator, effective Oct. 28, 2011. Mike Ruth, bus driver, start date: Oct. 3, 2011; salary: $18,131.95/year. Nicole Jones, Lenihan paraeducator, start date: Oct. 18, 2011; salary: $9.48/hour. Kayla Tate, Lenihan paraeducator, start date: Oct. 18, 2011; salary: $8.47/hour. Adrianna Madrigal-Vasquez, Lenihan paraeducator, start date: Oct. 18, 2011; salary: $9.48/hour. Gloria Harris, Rogers paraeducator, start date: Oct. 18, 2011; salary: $9.48/hour. John Augustine, assistant seventh grade girls basketball coach, start date: Oct. 18, 2011; salary: $2,242/year. John Fiscus, assistant seventh grade boys basketball coach, start date: Oct. 18, 2011; salary: $2,242/year. Cindy Jones, assistant MHS girls track coach, start date: Oct. 18, 2011; salary: $3,190/year. Allie Osmundson, MHS head girls soccer coach, start date: Oct. 18, 2011; salary: $4,099/year. Stacie Holmes, Hoglan paraeducator, change to MHS for 6.5 hours/day Monday, Tuesday, Thursday, Friday and 5.5 hours/day Wednesday. Salary: $8.96/hour. 804.2 Video Surveillance and Electronic Monitoring, change policy to reference FERPA, change state to Iowa (Ohio policy used as a template). 605. 3 Student Promotion – Retention, looked at policies developed by other districts; If students are not meeting grade-level expectations parents and school staff will meet to develop an intervention plan for the student. The school principal is responsible for monitoring the development and implementation of intervention plans. This evening the Board received two pieces of welcome news. We learned that our certified enrollment (that is, the enrollment which will determine the amount of state funding we receive in the 2012-2013 school year) is up by over 120 students this year. This translates to over $720,000 in additional revenue for next year – the year which has been projected to be the tightest for our budget since 2008. This, of course, doesn’t mean we don’t have to continue to spend very conservatively; but it could mean a few less difficult decisions. The second piece of information was that, although we are always concerned when families choose to enroll outside the district, our open enrollments have been and continue to be under the state average. One of the Board’s goals is to substantially reduce this number by pursuing a vigorous public relations campaign to spread the word about all the GOOD things that we offer our students and families. Watch for it! With less than one month in office, our three new board members have already demonstrated the ability to adjust to a hectic pace established by their veteran peers. In two October meetings, the Board has adopted a decision-making protocol for the Board, committed to study of a book called “School Board Member Handbook,” and dealt with issues involving budget, construction, policies, committee work, and student discipline. In addition, there has been a 90-minute board duties overview, a three hour orientation with district administrators, a four hour “board visioning” work session, and committee meetings of the Business Education Alliance, Advisory Committee on Intergovernmental Relations, and Design Advisory Committee. Within the next week the Board will participate in an Iowa Association of School Boards workshop called “Foundations of Effective Board Service,” as well as meetings of the Marshalltown Auditorium Foundation Partnership and the Labor Management Committee. I mention all of this so people can better understand that the Board’s commitment to our children and community goes well beyond the 5-10 hours per month of board meetings – many behind-the-scenes hours are necessary for successful governance of our district. 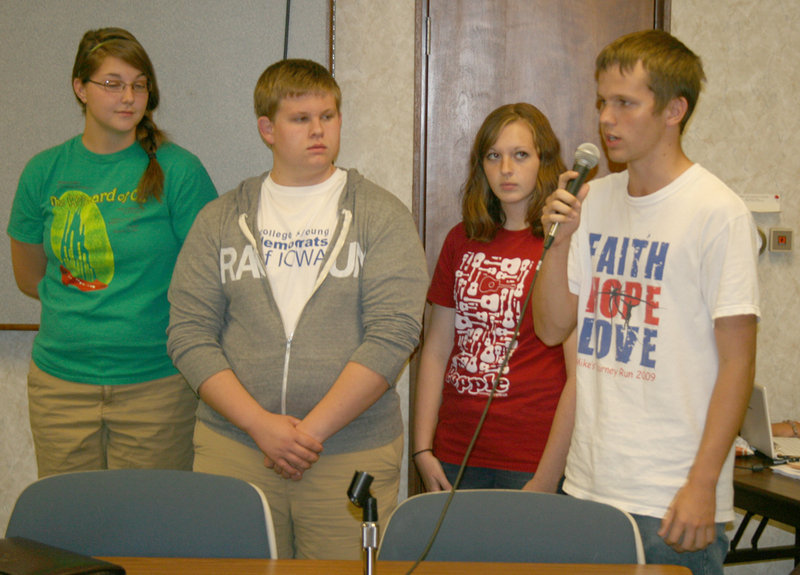 Members of Students Teaching & Empowering Philanthropy or STEP (L to R) Teresa Miller, Riley Willman, Lainey Crawford and Dan Martin, discuss how their organization supports numerous programs in Marshalltown. Students representing STEP (Students Teaching & Empowering Philanthropy) came before the Board Monday night to discuss their organization’s work in the community. STEP was formed during the 2010-2011 school year with the goal of engaging youth in philanthropy and giving in the community. The program is sponsored by the Martha-Ellen Tye Foundation and the Community Foundation of Marshall County. In the first year STEP included 20 members ranging from sophomores to seniors at Marshalltown High School. This year the group includes 22 members. Any MHS student is able to apply to be member. Dr. Susan Pecinovsky showed the Board detailed plans Monday for District professional development. “We worked very hard last spring to design professional development that does not pull teachers out of the classroom,” said Pecinovksy, associate superintendent for student achievement. The District added an additional day of PD to the beginning of the school year in August and added one mid-year on Jan. 2, 2012. Those, combined with the full-day Sept. 30, 2011, and Feb. 3, 2012, in-service days will provide staff with necessary training while keeping them in the classroom providing quality instruction. Administrators will also have regularly-scheduled PD, which includes work to become stronger leaders, focus on how to use data to inform instruction, and a book study. Work on Fisher Elementary and Marshalltown High School are on schedule, according District Architect Dave Schulze. Schulze and Buildings & Grounds Director Rick Simpson gave the Board an update on the district facilities plan Monday night. Schulze said work on the MHS second floor classroom addition should be completed on schedule in early 2012 and the Fisher Elementary renovation, remodel and addition should be completed by August 2012. Schulze and Simpson touched on many of the other projects in the facilities plan as well, including moving Central Office to the Support Services building (formerly Anson Middle School) and renovation of the Miller Middle School Auditorium and MHS Roundhouse. The Board approved change orders for two ongoing construction projects. A change order for Phase II of the Fisher Elementary project was approved for $19.462.33. This included lighting and mechanical adjustments and a tree removal and replacement. A change order for the Marshalltown High School second floor classroom addition was approved for $25,056. This included changes by the fire marshal and other adjustments. Tonight, Dr. Pecinovsky presented information showing how professional development is an important part of our district improvement effort. Later in the evening the Board of Education demonstrated a similar commitment by choosing to make “Board Development” a regular agenda item for MCSD board meetings. 1. What is our policy? 2. What is our current practice? 3. If there is a precedent what is it? 4. Is there any legal guidance in this matter? 5. Do we have adequate background information? 6. What input is there from appropriate staff and stakeholders? 7. What are options and alternatives? 8. What is the Administrative recommendation? 10. Is this in the best interest of MCSD students? This evening Dr. Susan Pecinovsky outlined the professional development that has been planned for the current school year for both teachers and administrators. Recently someone asked me, when I mentioned professional development in our conversation about the schools, “Why do they need professional development? Don’t they already know how to teach?” Tonight’s presentation answered that question so well, pointing out all of the different strategies that our teachers are employing in reaching students of varying abilities and backgrounds, making sure that all students end up with a sound educational foundation—and that the education is delivered in a safe, secure environment in which learning can thrive. This year’s program is especially good because much of the material was covered during two days of pre-opening workshops, thus preserving precious in-the-classroom time for teachers. Administrators, too, are constantly learning the strategies that their teachers use and also studying ways to collect and use data to strengthen instruction. Improving student achievement means more and harder work for both students and their mentors. Laurie Buchwald, Fisher Literacy Intervention Tutor, effective Oct. 5, 2011. Jill Biggs, MHS paraeducator, effective Oct. 5, 2011. Haley Williams, MHS paraeducator, effective Sept. 2, 2011. Kristine Fisher, Miller paraeducator, start date: Oct. 3, 2011. Salary: $9.48/hour. Patricia Nevarez, Franklin paraeducator, start date: Oct. 10, 2011. Salary: $8.47/hour. Kayleen Schwartsenburg, Miller paraeducator, start date: Aug. 22, 2011. Change from time sheet to contract.